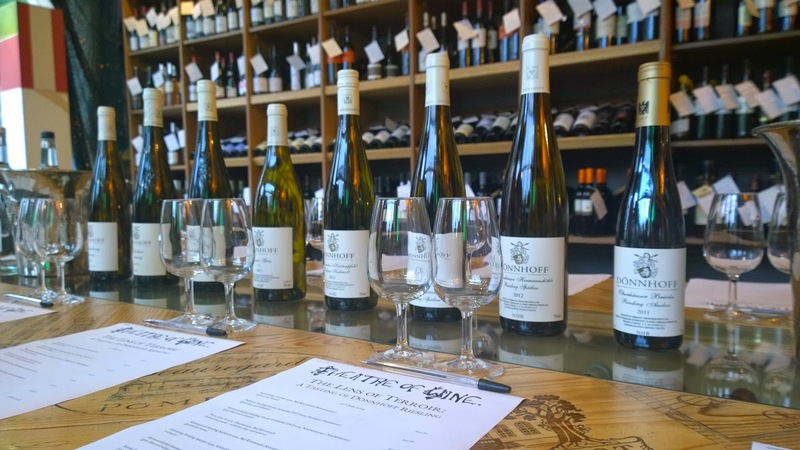 Dönnhoff Tasting at Theatre of Wine - "The Lens of Terroir"
Those of you with a keen memory may remember that a couple of months ago I went to a fantastic vertical tasting at West London Wine School featuring one of the premier Mosel wine producers, J. J. Prüm. Shortly after this I was alerted to a tasting being held at another of my favourite wine haunts, Theatre of Wine; they were showcasing one of the top producers from the Nahe - Dönnhoff. I simply could not resist the opportunity to learn a bit more about that noblest of noble grapes, Riesling. The session was led (admirably as ever) by Jason from Theatre of Wine, who had been over to visit the Weinguts just a week or so earlier and had spent some time with members of the Dönnhoff family. Instead of doing a vertical tasting, ie: tasting through the years, Jason had another idea; he wanted to look at wines from across the family's various vineyards (they have nine sites in total) in one single year, 2012. 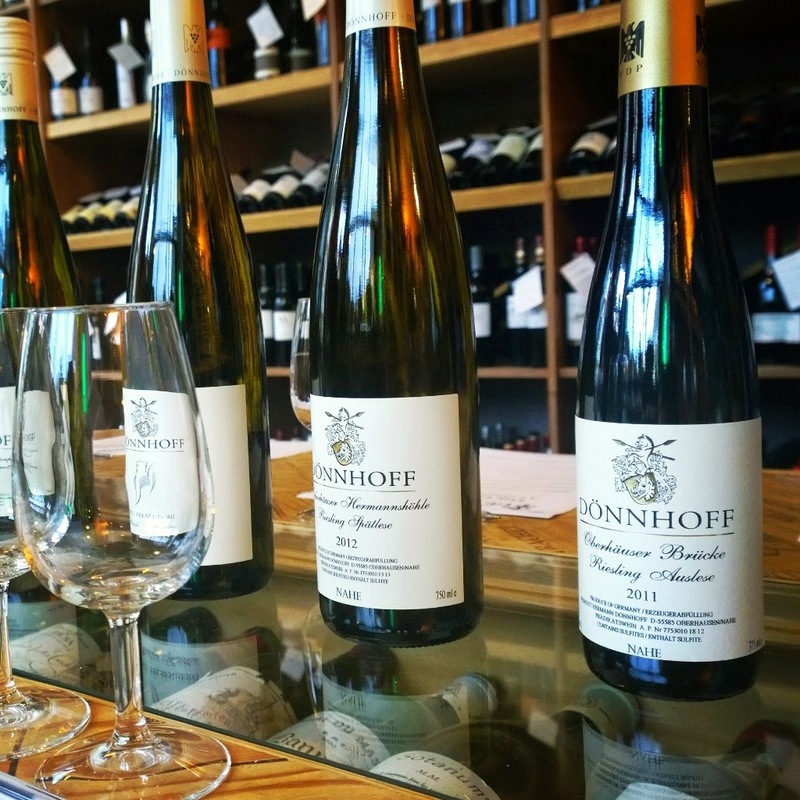 This is because the Dönnhoff family have a very interesting concept when it comes to their wine production; they produce all of their wine, from all estates, in exactly the same way in every given year. They don't believe in concepts that you may read about elsewhere such as "the craft of the winemaker"; instead they see themselves as the custodians of the vines and the grapes and it is their duty to produce them as best they can, without too much interference. They want to let the grapes and, in particular, the terroir speak for itself. Jason stated that it was his belief that no grape expresses its origin, its terroir as much as the Riesling grape and he wanted to demonstrate it through this tasting. We started with a Kahlenberg Trocken, Bad Kreuznach, Nahe (£24.70). Fresh and fruity, it had a slight vegetal layer of complexity on the nose. On tasting, it had a slightly spritzy taste with decent levels of acidity and minerality - which is what you're really looking for in these kinds of wines. Decent finish. 7/10. Dellchen Riesling Grosse Gewächse (the German equivalent of premier cru), Norheim, Mahe (£41.60). Very complex on the nose, heady and intense. Redolent of tropical fruits and side notes of spice. Really defined acidity on the palate giving an extremely long and bright finish. Fresh and grassy with hints of citrus fruits. Really classy and elegant wine. 8.5/10 (my favourite of the dry wines). Hermannshöhle Riesling Grosse Gewächse, Niederhäusen, Nahe (£43.40). Less fruity than the last wine, more vegetal. It asked more questions then it gave answers. On the mouth it was refreshing and finessed, poised and balanced, with a very long finish. I thought it was good, but it lacked a little of the oomph compared to the Dellchen. 8/10. We did try a Pinot Gris as a kind of mid-session interval and to mark the transition between the trocken (dry) wines and the halb-trocken (off-dry) wines. It wasn't for me really and I was glad to get back to the Rieslings! Krötenpfuhl Riesling Kabinett, Bad Kreuzberg, Nahe (£17.90). Kabinetts are the first level on the German Prädikatswein system. This was fragrant and had notes of tropical fruit, but it was slightly reserved on the mouth. It was, however, very good value for the price; a thoroughly decent wine. 7.5/10. 2011 Brücke Riesling Auslese Gold Cap, Oberhäusen, Nahe (£28.80/half). This was the one wine that wasn't from 2012. Notably sweeter than the two spätleses, seemed to have a touch of botrytis to it. My first thought on tasting it was of a lovely marmalade, sweet and fruity but with an undercurrent of acidity. Was very well balanced and had a long and insistent finish, which was comfortably over 30 seconds. 9/10. For details of upcoming tastings at Theatre of Wine see here.